Established in 1740 by William Varley, the Procter company of today has unrivalled expertise in Machinery Guarding, Fencing and Concrete Products. 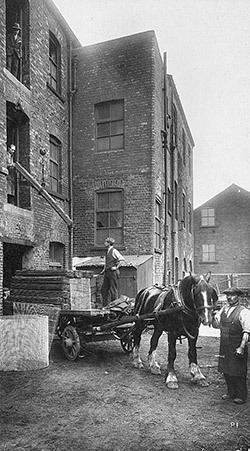 During the 18th and 19th centuries the business was mainly involved in the manufacture of a wide range of agricultural and domestic wire products from a number of small factories in Yorkshire. The trading name of Procter Bros (Wireworks) Ltd was introduced in 1884 by John and Charles Procter, and it was under their control that the company really started to develop its identity as specialist wireworkers. Procter Bros Ltd of today is managed by John’s great grandsons and Jeremy and his great great grandson, also called John is working in the business. In 1897, a Leeds inventor called James Henry Atkinson invented a better mousetrap which he named “The Little Nipper”. He asked Procters to manufacture these for him and in 1913 the company purchased the rights for £2,000. This was the start of 100 years of mousetrap manufacture by Procters before the expansion of the Pest Stop range and eventual successful sale of the business. With the outbreak of the First World War the company had gained considerably in stature and was involved in numerous government contracts, one particular instance being the supply of strong woven wire for use as a bomb proof guard over the roof of Buckingham Palace. In the twenties and thirties the company continued to develop its manufacturing base with a wide range of products such as machine guards, riddles, sieves, fireguards and wire fencing being produced. During the Second World War output was dramatically changed with the company supplying the military with parts for Bailey Bridges, parachute frames, and special wiremesh suitable for aircraft landing strips in sandy or marshy locations and fencing for virtually all the country’s aerodromes. A factory was established in Cardiff and later moved to Caerphilly and in 1970 to its current site at Bedwas. After the war the company reverted to its pre-war manufacturing base, supplying both the retail and industrial sectors through the fifties and into the early sixties. In the mid sixties the business was restructured to concentrate exclusively on the specialist fencing and machine guarding sectors of the industry while continuing to manufacture its famous Little Nipper mouse and rat traps. Today from its sites in Garforth, near Leeds and Bedwas in South Wales, the company is a market leader with its nationwide Machine Guarding, Fencing and Concrete Products that integrate the best of traditional skills with the latest techniques and services. Prestigious contracts in recent years include the railings and ornamental gates of Kensington Palace and major guarding projects for the London Underground Jubilee Lines, and numerous projects in Motor Industry plants in the UK, as well as for Ingersoll's Chrysler project the USA. The Procter business of today operates four separate divisions: Procter Machine Guarding, Procter Contracts, Procter Supplies, and Procter Cast Stone. At Garforth, the introduction of cast stone architectural products is providing strong growth to supplement our traditional fencing products. The cast stone business continues to grow well and is getting major investment in 2015. Within Procter Contracts we have the operating brands of Fencing Systems, Automatic Gates and Street Furniture, and within Procter Supplies we have Fencing & Concrete Products, plus Gates - Railings - Metalwork. By drawing on the combined capabilities of our separate divisions and their operating brands, we are able to provide a comprehensive offer to our customers. For example, on construction-related projects Procter Contracts can bring in our Cast Stone division to offer railings installed on cast stone copings, plus street furniture incorporating the use of steel, timber and cast stone. Similarly, Procter Machine Guarding and our Gates - Railings - Metalwork operating brand regularly co-operate to provide access platforms and other specialist and bespoke metalwork products. Still very much a family firm Procter Bros recognizes the need to develop its products markets and staff to meet the challenges of global business and to secure the future success of the business. In all our divisions, we aim to combine the best aspects of traditional craftsmanship and care for our customers and employees, with up-to-date technology and production methods.